The busy elves in TG4 have gathered up the finest TV ingredients for a delicious festive Christmas Cake of programming this year. Featuring live entertainment, festive music, lots of live sport, exclusive documentaries and great films, this years schedule is packed full of a host of favourite flavours to suit all tastes. ‘Anna May – Banríon an Plough’ – a one-hour observational documentary following Managing Director of The National Ploughing Association, Anna May McHugh. ‘Muintir Mhaigh Eo ar an Titanic – Waking The Titanic tells the tragic story of 14 people from the village of Lahardane Co. Mayo who set off to America in search of a better life. ‘The Armed Man – A Mass for Peace’ – A unique performance of Sir Karl Jenkins’ The Armed Man: A Mass for Peace conducted by Jenkins himself at the ‘Sing for Peace’ concert held in Berlin in November to commemorate the centenary of the end of the First World War. The concert brought together The World Orchestra for Peace and 2,000 singers from 30 countries, including seven choirs from Ireland. Programme presented by Caitlín Nic Aoidh. ‘Fáilte 2019’ – Ring in the New Year with ‘Fáilte 2019’ TG4’s New Year’s Eve show live from Donegal! Pádraig Ó Sé heads off to meet co-presenters Caitlín Nic Aoidh and Mairéad Ní Mhaonaigh to see what the celebrations are like up North. Join Polca 4, The Friel Sisters, the Conifers, Clann Mhic Ruairí and plenty more for an action-packed night of music, dance, songs, memories and celebrations as we look back at 2018 and ahead to 2019. ‘Cabaret Craiceáilte @ 25’ – One of the most revolutionary Irish language events, The Cabaret Craiceáilte celebrates 25 years this year. A feast of music with performances from KILA, Bréag, Basork, The Mooneys, The Campbells, Emma Ní Fhíoruisce, Eve Murtagh and many more as well as a snapshot of some of the most exciting Irish language music events of the last year. ‘Cúl Stáitse’ – We join the competitors backstage as they prepare to take to the stage. Who will be the winners of Oireachtas na Samhna 2018 and which community will claim Corn Uí Riada this year? ‘Aon Lá Amháin’ – An enchanting half hour documentary that follows six anglers, a grandfather and grandson, mother and son and two lifelong friends as they explore Lough Corrib, searching for elusive wild trout. ‘Idir Dhá Chuairt’ – Cathal Mac Coille examines the social and economic changes which have taken place in Ireland since Pope John Paul II’s visit to Ireland in 1979. The schedule is rich with a generous mix of sport including live rugby, documentaries on sporting legends, compilations of the highlights in GAA and a look back at some of the years big matches. ‘Rugbaí Beo’ – Live free to air coverage of Connacht v Ulster from The Sportsground Galway in the Guinness PRO14 as well as the clash of Munster v Leinster from Thomond Park. ‘GAA – Cúil na Bliana 2018’ – Featuring all the best hurling and football goals of the year from all the major Gaelic Games competitions. ‘GAA Beo – Na Scéalta 2018’ – A look back at all the stories, action, highlights and news from the GAA during the past year. ‘Páidí Ó Sé – Rí an Pharóiste’ – A creative documentary telling the story of Páidí Ó Sé – football hero, rogue and a man considered by many to be the uncrowned king of his native parish of Ventry, Co Kerry. ‘Laochra Gael – Ciarán Carey’ – A giant of a player for Limerick during the nineties, exceptional at midfield or centre back, Ciarán Carey led the charge throughout Limerick’s campaigns to achieve All Ireland glory. ‘Tír Eoghain: The Unbreakable Bond’ – The untold narrative behind the most successful minor team in the history of the GAA – the Tyrone ‘Class of 1997/1998’. The film focuses on the personal experiences and emotions of this unique group of minors who along with their manager, Mickey Harte, graduated to the Tyrone Under 21’s where they won two All Irelands, culminating in the 2003 senior triumph. ‘GAA USA’ – Dara Ó Sé explores how the US clubs began to import Irish players, paying them to play in weekend games or for entire summers. ‘Cluiche Ceannais Iomána’ – Another chance to watch Limerick vs Galway from this years All Ireland Hurling Final. ‘Cluiche Ceannais Peile’ – The 2018 All-Ireland Football Final between Dublin and Tyrone saw the two heavy weights of Gaelic football doing battle once again. Re-live the final again with commentary from Garry Mac Donncha. It’s jam packed with music of all flavours – Trad, Sean Nós, Country and Rock. We have brand new programmes from Doolin Folk Festival, documentaries on Junior Crehan, ‘An Bhuíon Cheoil’ about a Donegal fife and drum band, another on the Tulla Céilí Band, as well as concerts with Tommy Fleming, Sean Keane, Tradfest, Opry le Daniel, highlights from Oireachtas na Samhna and lots more too. ‘Doolin Folk Festival’ – It’s the 5th year of the Doolin Folk Festival and it just gets better and better with wonderful acts like Luka Bloom, Susan O’Neill, Muireann Nic Amhlaoibh, Martin Hayes and Steve Cooney along with the legendary Paul Brady and many more. ‘An Bhuíon Cheoil’ – Set in west Donegal, An Bhuíon Cheoil looks at the local love affair with the fife and drum band. ‘TradFest TG4’ – TradFest brings presenter Doireann Ní Ghlacáin to bluegrass band ‘I Draw Slow’ in the Printworks in Dublin Castle. Also in the show we hear from Paudie O’Connor & Aoife Ní Chaoimh, Máiréad Hurley, John Blake & Paddy McEvoy and Gweedore singer and bouzouki player Cathal Ó Curráin. ‘Súil Siar Corn Uí Riada 2018’ – A look back on the Sean-Nós singing competition, Corn Uí Riada, from Oireachtas na Samhna 2018 from the INEC in Killarney. ‘Súil Siar Steip 2018’ – A look back on the main individual Sean-Nós dancing competition for adults from Oireachtas na Samhna 2018 at the INEC in Killarney. ‘Hammond: Duais an Dorais’ – This documentary examines the life of David Hammond – broadcaster, singer, and filmmaker. Combining impressive film archive and interviews with Irish artists, this film reveals the lasting legacy of a remarkable man. ‘The Tulla Céilí Band’ – The story of a tradition which has been handed down and how it continues to survive in an often impatient and quickly changing environment. Driven by passion and a love for céilí music, the Tulla Céilí Band are going stronger than ever more than seventy years after they were formed. ‘Lumen i Luimneach – Ceol Uí Shúilleabháin i Séipéal Naomh Mhuire’: Brian Kennedy, The Monks Of Glenstal, RTÉ Concert Orchestra, and Noirín Ní Riain in a memorable evening of celebration with the music of Micheál Ó Súilleabháin. Sadly, Micheál Ó Súilleabháin passed away on the 7 November 2018. ‘Seán Keane & The RTÉ Concert Orchestra’ – A concert, filmed at the National Concert Hall in Dublin, of ‘Gratitude’ an album recorded by Seán Keane with the RTÉ Concert Orchestra under conductor David Brophy. This is Seán’s 11th solo album and has 12 tracks on it, some old and some new. ‘Hup na Nollag’ – This special Christmas edition of Hup comes from Kinvara and features many of Ireland’s finest performers. Máirtín O’Connor performs with the ConTempo Quartet, Cathal Hayden and Gary Ó Briain as well as that we will hear a song from Corn Uí Riada winner Bríd Ní Mhaoilchiaráin. ‘Opry le Daniel – Charley Pride’: ‘Opry le Daniel’ returns to the Millennium Forum in Derry with Daniel as MC to present a very special programme with the legendary Charley Pride. The audience will get an insight into the life of Charley Pride. He will perform on his own and of course alongside Daniel himself. ‘Rory Gallagher Irish Tour 1974’ – Rory Gallagher was the People’s Guitarist. Unassuming but tenacious, the Irish blues man devoted his life to touring and playing his beloved Fender Strat to adoring audiences. ‘The Rolling Stones: Live At Hampton Coliseum’ – The hugely successful Rolling Stones American Tour of 1981 culminated with a stand-out live performance on 18th December of that year; also becoming the first ever music concert to be broadcast on television as a pay-per-view event. The footage from this event has now been diligently restored and the sound has been newly mixed to fully enhance this stand-out concert from the Tattoo You tour. Including Rolling Stones classics from their catalogue and a legendary altercation between Keith Richards and a stage crasher. ‘John Mayall & Eric Clapton: 70th Birthday Concert’ – A special 70th birthday celebration in honour of John Mayall. ‘Bob Geldof and The Boomtown Rats’ – play live to a sell-out crowd at London’s Dominion Theatre in 1985, in support of their last album together, In The Long Grass. They performed their number one hits Rat Trap and I Don’t Like Mondays as well as many other hits. ‘Nina Simone: Live at Montreux 1976’ – Filmed live in 1976 at the Montreux Jazz Festival, a powerful performance from one of the greatest jazz singers of all time, Nina Simone who was one of the greatest female vocalists of the 20th Century. ‘This is Spinal Tap’ – Spinal Tap, one of England’s loudest bands, is narrated by film director Marty DiBergi on what proves to be a fateful tour. Adding a little sparkle to the decoration we have a host of top class films, including ‘Titanic’, ‘Moulin Rouge’, ‘Nacho Libre’ & ‘O Brother, Where Art Thou?’. For younger viewers the feast includes ‘Star Trek: Into the Darkness’, ‘Bee Movie’, ‘Rango’, ‘The Spiderwick Chronicles’, ‘Hotel for Dogs’, ‘Ice Age’ & ‘Dr Seuss’ The Lorax’. And, as ever we will have high Yuletide drama with the residents of ‘Ros na Rún’ as an unexpected visitor arrives at the Daly household. Will this visitor bring peace and tranquillity, or make John Joe’s heart skip a beat? Máire has Laoise convinced Micheál has an extra special present under the tree for her this year. Will Laoise be disappointed or will it be Reailtín who gets the hump? Berni’s house is full of Christmas cheer, but will an uninvited guest put an end to that. 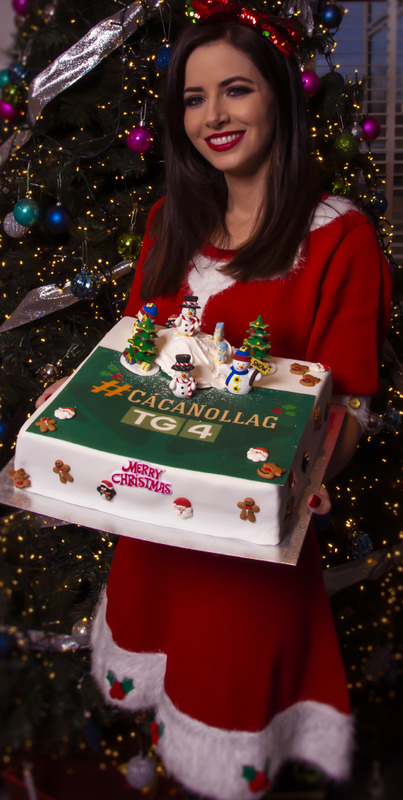 So, forget the turkeys this Christmas, get stuck into the #CácaNollag on TG4 for a cracking festive treat! And, the naughty thing about Christmas Cake is you can have a little, or a lot, whenever you like – on social media @tg4tv, or on the www.tg4.ie player worldwide!